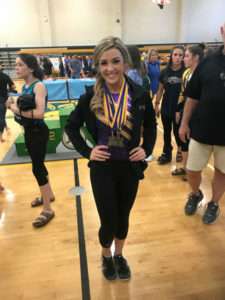 Hahnville’s Kamryn Ryan earned another three state championship medals in gymnastics, including the overall crown at the state’s highest level of competition. After taking the Division I state championship gymnastics tournament by storm as a freshman two years ago en route to an overall state championship, Kamryn Ryan admitted falling just short of that goal as a sophomore left her devastated. Now a junior, Ryan is back on top, her total score of 38.250 outpacing the field significantly as she captured her second all-around Level 8 state championship in three years. Ryan also earned individual event state championships in the bars and vault events, while earning runner-up honors on the beam and floor categories. The wins bring Ryan’s championship medal collection to eight in three years, including two overall state championships and six individual event titles. She also has three second place finishes and a third place finish in individual events and was the all-around state runner-up last season. Kamryn Ryan displays her state championship medals. 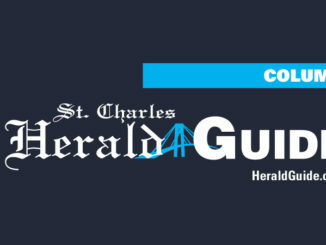 This year’s competition displayed another stellar performance for a gymnast who has established herself as one of the state’s very elite competitors — and quite arguably the very best. Level 8 is the highest classification the LHSAA holds competition within. Ryan has been at Level 8 of Division I since her freshman year, and outside of the prep ranks, she competes at Level 10. Ryan said she felt locked in for most of the championship tournament, particularly so when competing in bars, where her mark of 9.700 bested the second ranked competitor, Emma Armstrong of Caddo, by a full .15 points. 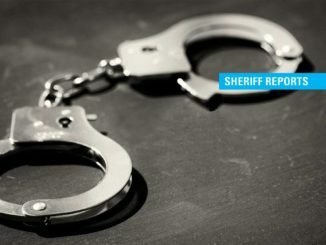 “I felt I really hit it and stuck the landing, hit all my handstands, pointed my toes and everything … I made sure my technique was correct and felt I really had that down,” Ryan said. Still, she said she wasn’t convinced she had earned the overall crown until the first few event scores were announced. Ryan scored 9.650 in the vault (outpacing the second place mark of 9.400), 9.250 on the beam and 9.650 on the floor. After two years of state competition, Ryan said she felt at home. “I knew the atmosphere, knew how the equipment felt … I was a little more relaxed this time. I think that experience really guided me,” Ryan said. Another plus was the addition of new teammates. 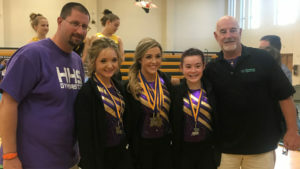 Hahnville established its gymnastics program coinciding with Ryan’s arrival, and two years later it had enough competitors to not only compete as a team at state for the first time, but to excel: the Tigers finished second in the division. 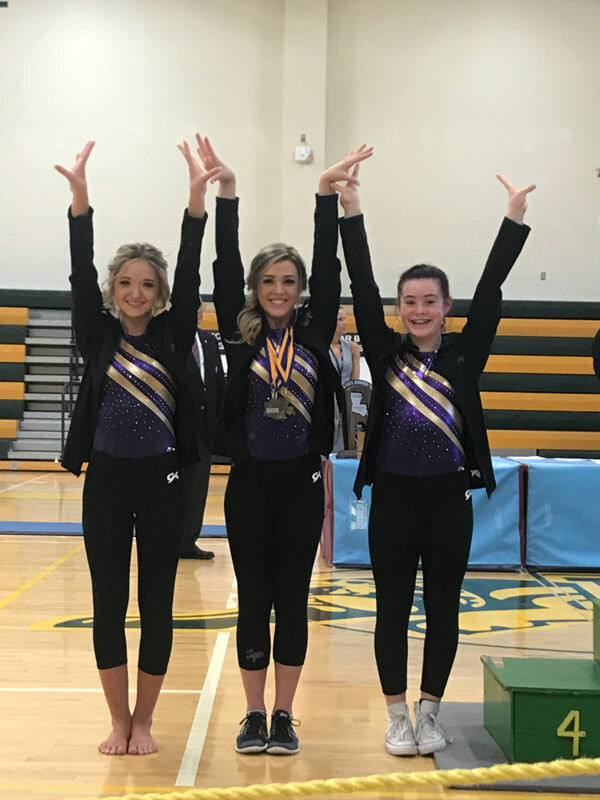 Along with Ryan, Hahnville sophomore Katie Kunkel and freshman Emily Gooden each competed at level 8 and placed 10th and 15th overall in state, respectively, helping to lift Hahnville within four points of state champion Dutchtown. 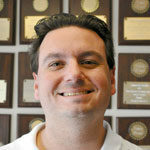 Beyond the success component, Ryan said being there as a team made the entire event that much more enjoyable. As a freshman, she was Hahnville’s lone competitor against other teams with as many as 15 competitors, which she called intimidating. Coach Brian Crochet, Katie Kunkel, Kamryn Ryan, Emily Gooden and Elmwood Gymnastics coach Toby Barentine. “I’ve trained (outside of Hahnville) at a smaller gym where I’ve been the only Level 10 gymnast, so it’s something I’ve never really had … teammates rooting you on and everyone there competing together. I thought it was really cool this year for us to be up there qualified as a team,” Ryan said. 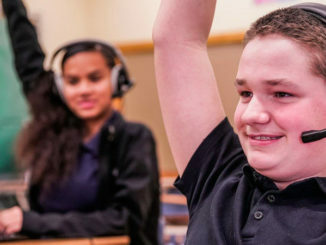 Ryan won state fresh on the heels of her performance at a national regional performance in Florida, where she was chosen as first alternate on the national team. Nor has been her impact on gymnastics locally, as her talents helped inspire the Tigers’ now growing gymnastics program. 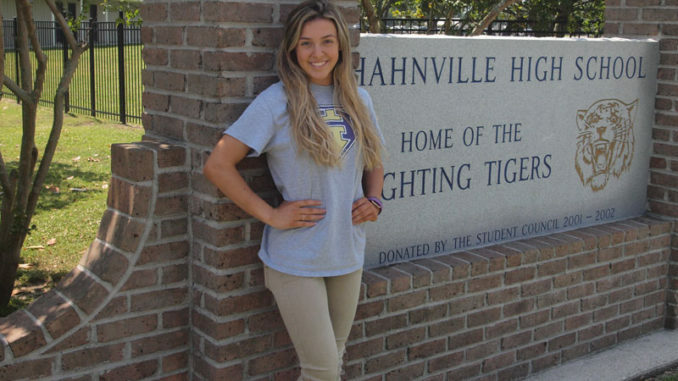 “Gymnastics isn’t really a big sport (on the high school level) in terms of recognition, so to know my dedication helped this grow here, it just makes me that much prouder to be a Hahnville Tiger,” she said. Teammates Katie Kunkel, Kamryn Ryan and Emily Gooden after the state gymnastics meet.